PRODUCT DESCRIPTION: Unique bait station that's designed to be placed where traditional bait stations cannot fit. 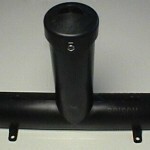 Looking like two "pvc" tubes, this station is ideal for use on fences or tree limbs. The bottom tube is where rodents will enter. The top tube is where bait is applied. It features an allen key lock which holds the lid on securely making it tamper proof. When the cap is removed, a long rod is extracted to which bait blocks can be added. This rod has a wing nut at the end so bait blocks can be placed over the rod and then kept in place with the wing nut. The best bait to use in this station is our Bromethalin Blocks. They are just the right size to fit inside the tube and are pre cut with just the right sized hole for easily attaching them to the bait rod. These blocks are our TOP GUN BAIT BLOCKS. When the cap is placed back over the station, the bait will hang in the path below where the rodents will pass when they move in the tube. The other great feature of this station is that it can be attached to tree branches or fences via one of the two mounting options. There are two mounting holes through which screws or nails can be placed if you are going to be using it on wood. These holes can clearly be seen in the picture above. The other mounting option involves two slots on top of the station not visible in the picture above. These slots are on top of the station and will allow you to strap the station onto something like a fence rail by using a CABLE TIE. 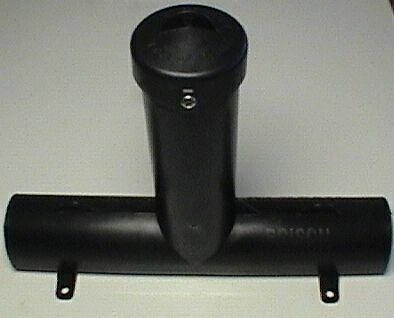 WHERE TO USE IT: Though this design was created for unique applications, it can be used most anywhere a standard more traditional bait station can be used. However, for reasons explained in detail above, it is really suited for places where flat low profile stations cannot be used. Such areas would include tree limbs, fences, poles, round surfaces, etc. and pretty much anyplace a flat lying station isn't suited. I need to get a key for my Protecta Evo Express mouse bait stations. Do you have/sell those keys for the Express?